Jay’s dad drove the elevated “L” out of the Howard Street station in Chicago where Jay learned to play checkers with the crews in the ready room. His dad let him ride up front with him when he took the “L” to the shops. 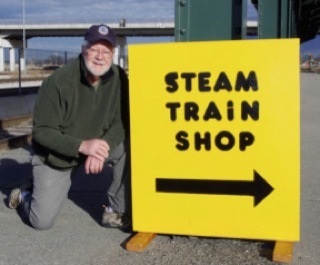 Jay’s dad then worked his way up to Engineer on the Atchison Topeka & Santa Fe out of San Bernardino. He shuttled WWII war equipment and materials over Cajon Pass to the desert training grounds. Jay’s first steam train ride was a solo trip from Chicago to the plains of Montana when he was seven, where he lived with his grandma for part of the war. He fondly remembers being put into the hands of the black porters who passed him along for the multi- day trip. The porters taught him how to whistle and make a Pullman pull down bed. He served in Korea where he was a member of the Army all Far East rifle team. His career as a hospital CEO didn’t provide any of the technical tools needed to bend metal, hot rivet or fix a boiler, but his days of owning a flour mill specializing in stone ground products did teach him how to wield a hammer and saw. Jay served on the Union Station Foundation’s board before he became active with the restoration team of #223. Jay can look at a situation and always find non technical things to help the cause. He has been successful to garnering community support for projects, raise small sums of money and finding community volunteers for special purposes.